Can you have too much ERP custom software application development? Cloud ERP is a type of enterprise resource planning (ERP) software that is hosted on a cloud computing platform, rather than on premises within an enterprise's own data center. ERP is an industry term for the broad set of activities that helps an enterprise manage different parts of its business, such as purchasing, inventory management and customer relationship management (CRM). ERP applications can also include modules for the finance and human capital management aspects of a business. Unlike on-premises systems, cloud ERP -- which is a type of software as a service (SaaS) -- increases accessibility via the internet and enables users to share and transfer data across business departments, as well as externally, in real time. Because it is cloud-hosted, businesses are notified of any updates to the software immediately. Cloud-based ERP also comes with availability, backup and disaster recovery plans from providers to reduce interruptions to the software. Like other service models, cloud ERP follows similar payment models: Enterprises pay for used resources monthly, rather than a fixed price all upfront. It also removes the need for additional hardware and maintenance on site, which decreases operating costs. As business needs change, enterprises can alter how much they use cloud services and scale resources. Cloud ERP provides many benefits, but it also creates some management challenges. Admins lose a certain amount of control when an enterprise moves off site, as providers take on most of the responsibilities. While there are some customization abilities, there are far more with on-premises infrastructure. Admins have to implement new management processes for a cloud-based ERP system, which can create some integration issues. John Harris, CFO of CREDO Mobile, talks about his move to cloud-based ERP. Also in cloud, enterprises need to depend on the provider's security, which may or may not be as secure as on-premises ERP systems. Admins must pay special attention to data residency requirements and follow standards and regulations to remain compliant, as information can reside in multiple data centers across various regions. Lastly, as an enterprise grows, its requirements could change, and it may want to purchase additional modules from other vendors to supplement any gaps in cloud services. Integration complexities can occur when an enterprise uses multiple services, as some cloud applications will have to move across third-party products. Cloud ERP software is primarily used by small- and medium-sized businesses and is a good fit for startup organizations and new business divisions within an existing company. Some cloud-based ERP vendor options include Acumeatica, Deltek, Epicor, Oracle, Microsoft Dynamics, Rootstock Software, Sage and SAP. What issues did you experience during your move to cloud-based ERP? What is the risk in using this type of ERP Modules (Cloud Based Systems) in comparison to popular / classical systems such as SAP and Oracle, where the company uses its own servers to protect confidentiality of its critical information such as Procurement and supply chain cost and sources and similar components which forms the basis for its products pricing and marketing operations. 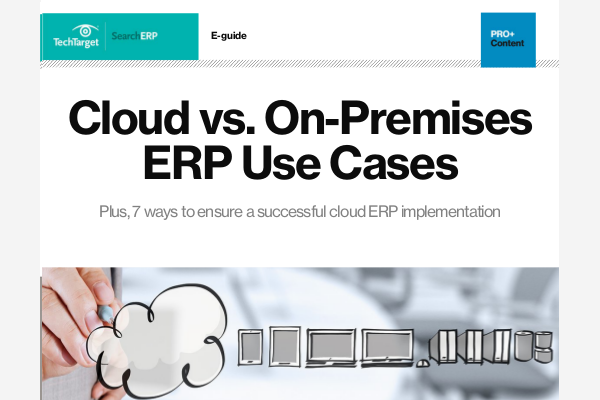 The risk with cloud-based ERP is even lower than with on-premise systems. The security used is bank-grade - any data breach would be catastrophic for companies like NetSuite. I believe there won't be any problems while migrating to cloud from on-premise system usually.